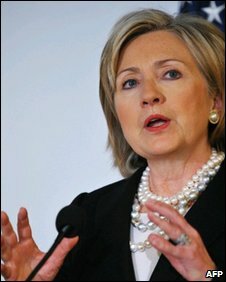 US Secretary of State Hillary Clinton has called on Latin American countries not to get too close to Iran. Mrs Clinton said countries such as Venezuela and Bolivia should "think twice" about the consequences of their ties with the Islamic Republic. Iran's President Mahmoud Ahmadinejad last month visited Brazil, Venezuela and Bolivia which voiced support for Iran's right to a nuclear programme. The US is among those countries with concerns over Iran's nuclear aims. "I think if people want to flirt with Iran, they should take a look at what the consequences might well be for them. And we hope that they will think twice and we will support them if they do," Mrs Clinton said during a state department briefing on US-Latin America ties. State Department officials told BBC Mundo that "consequences" did not refer necessarily to specific actions but rather referred to the possible effect on US relations. Mrs Clinton said the State Department was well aware that Iran had been stepping up its diplomatic activities in the region. "We can only say that is a really bad idea for the countries involved," she said. "This is the major supporter, promoter and exporter of terrorism in the world today." Mr Ahmadinejad visited regional power Brazil in November. President Luiz Inacio Lula da Silva said Brazil recognised Iran's right to develop a peaceful nuclear programme, but also urged Iran to engage with the West. Several regional leaders, including President Evo Morales of Bolivia and Venezuela's Hugo Chavez, have pursued closer ties with Iran in recent years, as well as with Russia and China. "We have no problem with any country, such as China, engaging in economic activities, business, commerce with any country anywhere," Reuters quoted Mrs Clinton as saying. "But we do want governments to drive hard bargains. We don't want to see corruption that benefits the fortunes of a few leaders and undermines the sustainability of the economy and the environment and the natural resources of any country." Mrs Clinton also defended Washington's reaction to the crisis in Honduras where President Manuel Zelaya was ousted in June, saying the US had followed a "pragmatic, principled, multilateral approach" aimed at restoring democracy. The issue has cast a shadow over Washington's ties with some of the region, where Brazil and Argentina have been among those countries that insist Mr Zelaya must be returned to office to see out the rest of his term until January.